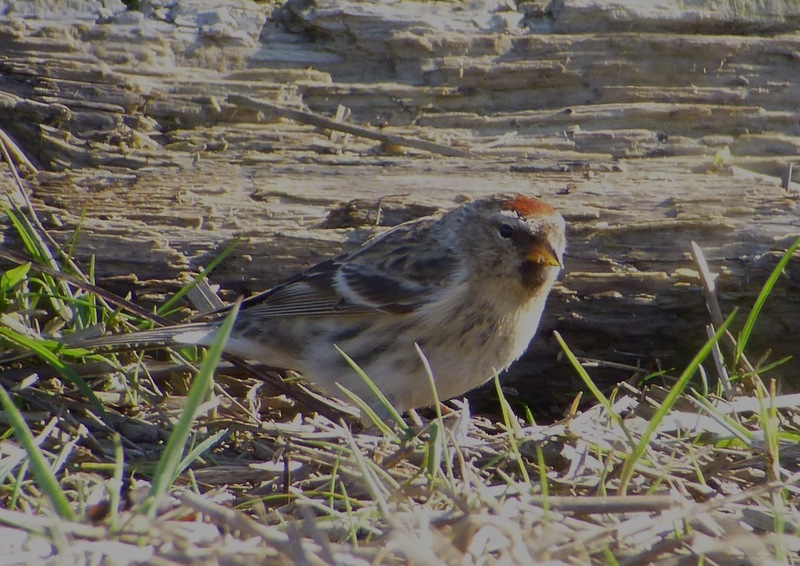 Managed to call in at Weld Road for 30 minutes or so late this afternoon – Skylarks going bonkers, Mipits and at least six Redpolls still on site, but much easier to watch in the sunshine and light, if cold wind. 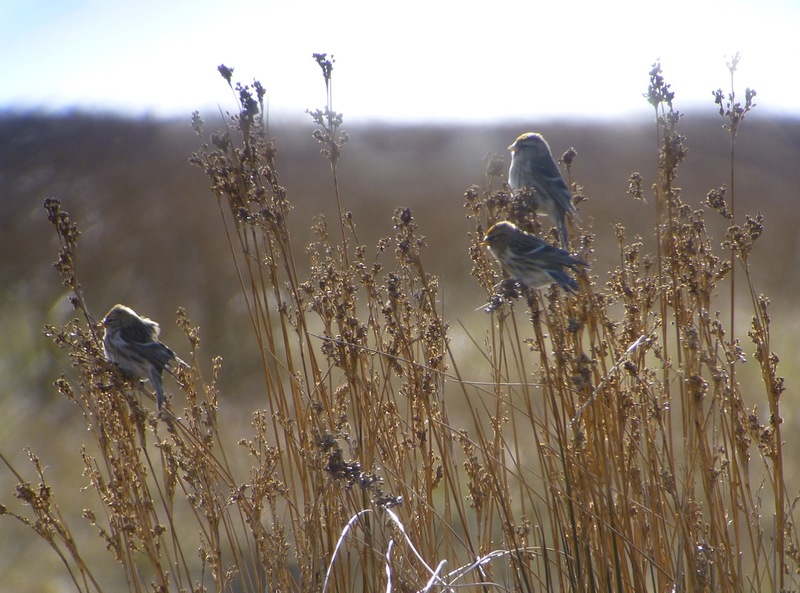 These cracking little finches were scoffing seeds furiously in the high strandline, ignoring passersby so that I was able to walk within a few feet of them while they carried on feeding, or perched up on the sedges, their red caps glowing in the spring sun. No sign of any Twite though – perhaps they were elsewhere on this stretch of coast at the time, or perhaps they’ve finally cleared off? 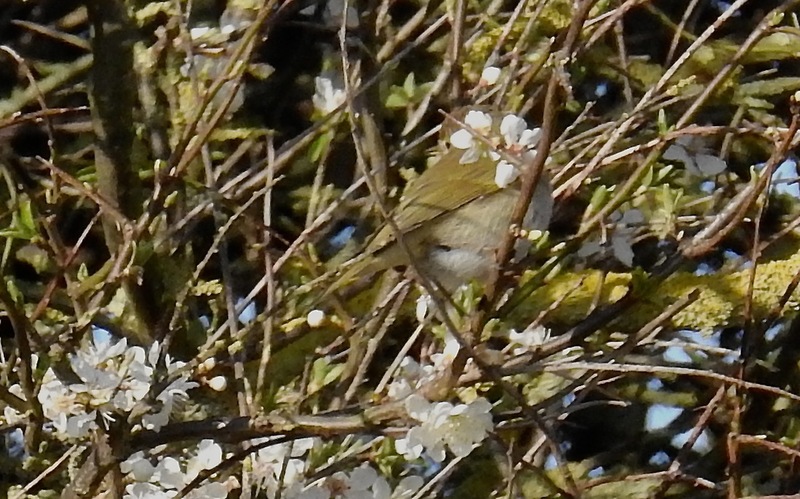 (Earlier several Chiffchaffs singing away on the NNR at Ainsdale). I really tried hard to reggae-if-i-cate the freezing cold, heavy squalls away using the power of the mighty Mr Lee Scratch Perry at Volume 32 this morning, but even The Upsetter couldn’t make the strong, icy wind any warmer, or the rain any lighter. Perhaps I wasn’t playing him loud enough. Either way, Weld Road did not look particularly inviting, but I wanted to see if I could pick up any colour rings in the Twite flock before it finally clears out (a few BTO rings visible, but nowt else). 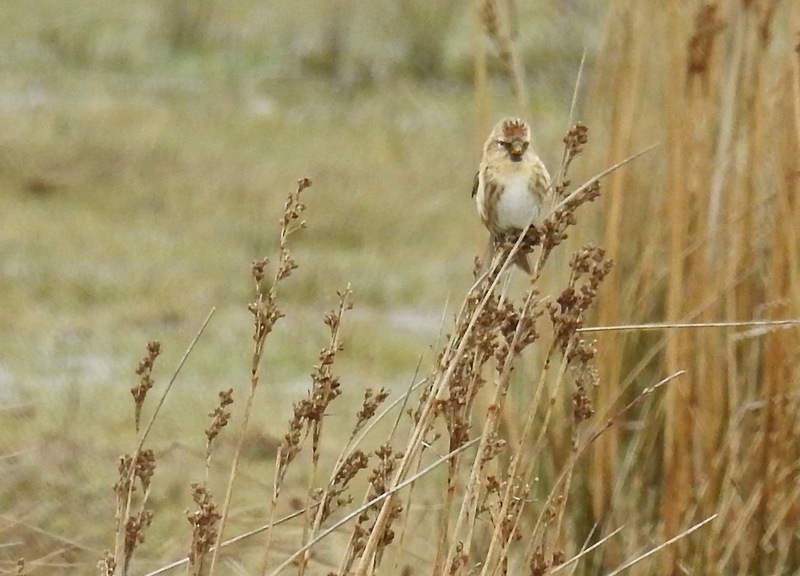 As I walked north along the tideline it felt most unspring-like, although there were three Stonechats (two singing), numerous Mipits, Reed Buntings and a few Skylarks and Pied Wags. Just before the rain came in again I bumped into one of the Redpolls – small numbers have been mixed in with the Twite and Linnets on the upper strandline here for the last three weeks at least, and any opportunity to watch them low down rather than swaying on backlit branches (or buzzing overhead while you snap your vertebrae back), should not be passed up. Certainly there were three this morning, possibly more, all happily changing size, shape and colour as their mood dictated – chameleon finches baby. 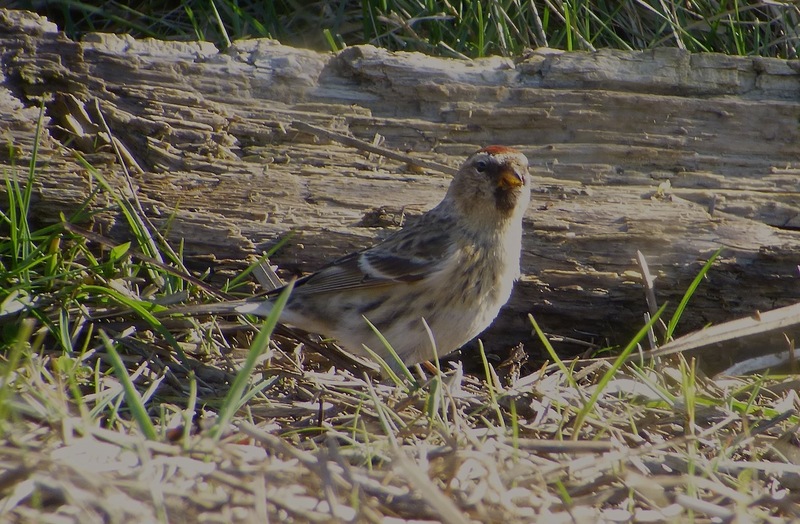 The Redpolls tend to perch up on the sedges occasionally, giving great views. 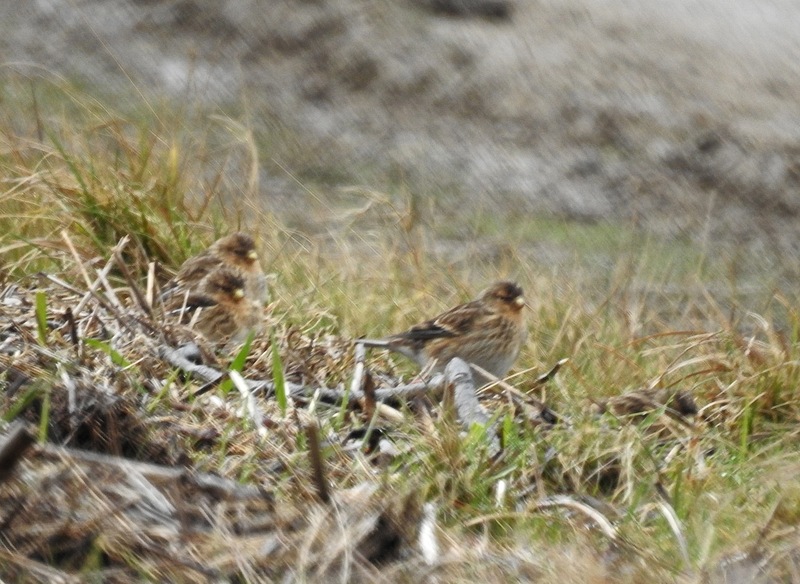 Something the heavier Twite and Linnet couldn’t pull off even on a flat calm day I suspect. 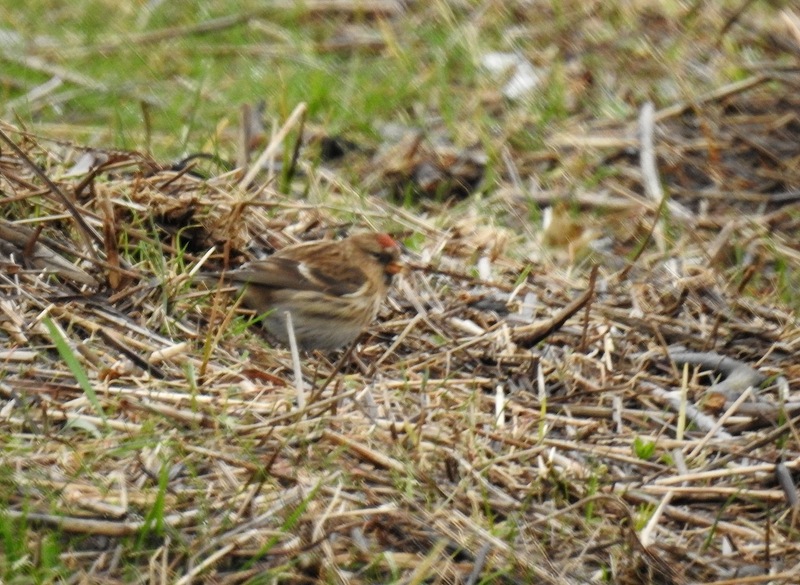 All Lessers (or maybe that’s just what they want you to think), the Redpolls are a pleasing dash of variety amongst the Twites and Linnet, which were doing the usual – impossible to get sharp images of them in the wind and rain though (excuses, excuses). Once I was drenched enough and had lost all feeling south of my scarf, I realised I’d spent sufficient time with little streaky brown finches, so drove up to Marshside. 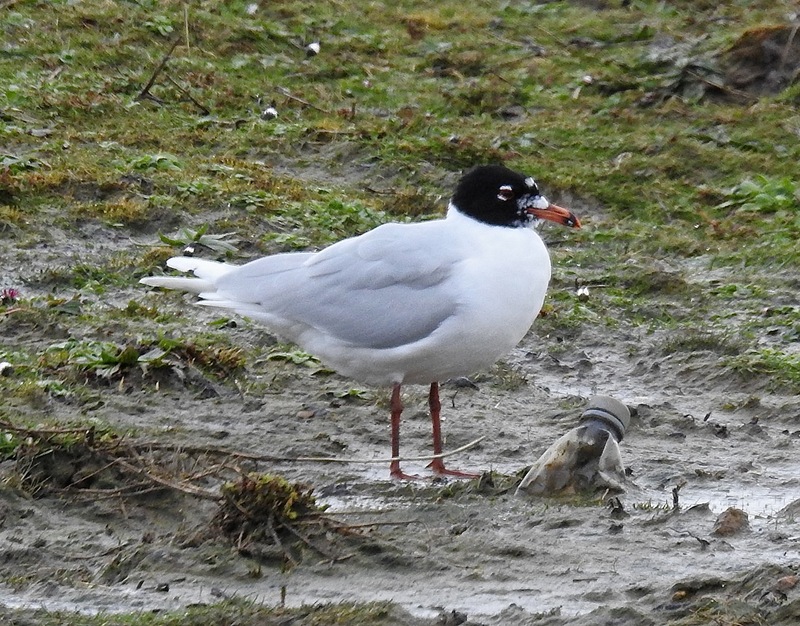 No sign of a thaw there, although the Med Gulls were performing well in front of Sandgrounders. Across the road a few Mipits and a single calling Goldcrest in the remnants of the Forest of Bale made a poor show of a Spring Bank Holiday. Always a relief to get the annual MoT ritual out of the way, even if it meant missing what was looking like a gorgeous morning in the field today. “Your car really needs a tin of new hyper-valve purge monkey sprocket oil”. “Well no, but we’ve got a great big job lot of the crap to sell, and we’re trying to shift it for 20 quid a can”. And the new air freshener smelt like a particularly car-sick Mealy Parrot had been poorly in the boot. (If it was a Scarlet Macaw, I imagine the back seat would have smelt of strawberries). 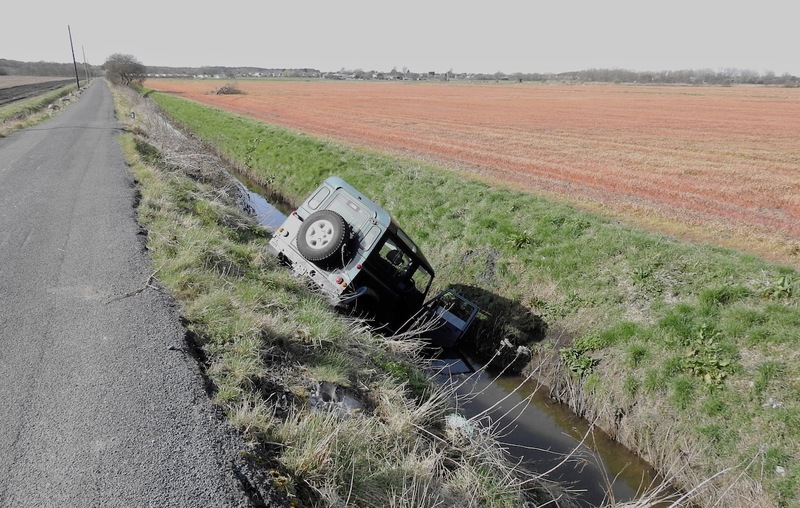 Anyway, by the time I’d got the vehicular *rsery out of the way and done a bit of gardening at Dempsey Towers (singing Goldcrest and still six Siskins and a single Redpoll finch fans), Good Friday was warm and sunny enough to guarantee a very busy coast, so I headed inland onto Plex instead. 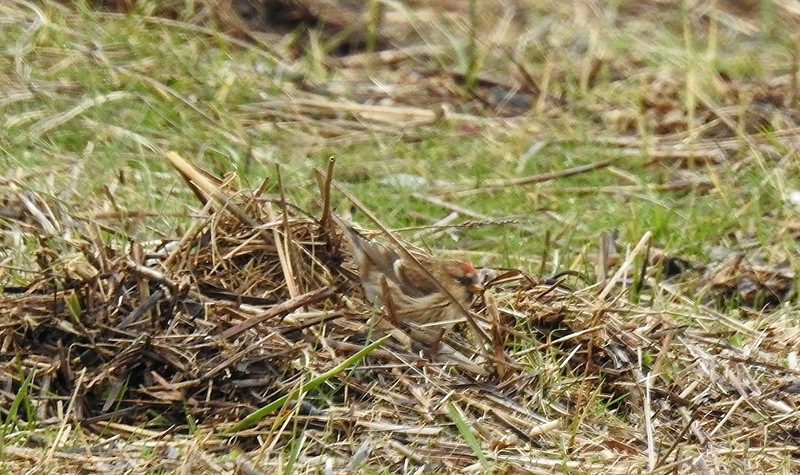 Dry enough to get the top soil blowing about, but a worrying lack of Corn Buntings today, despite the sunshine. Hopefully just an odd day. 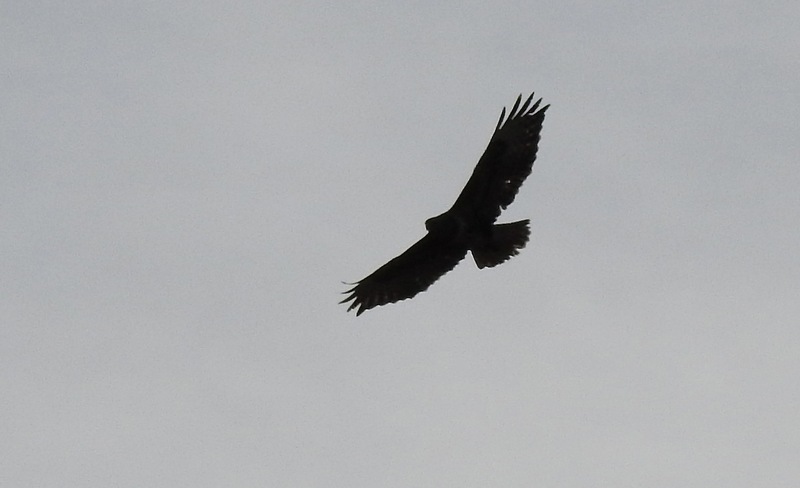 The Lapwings were ratcheting up their zero-tolerance anti-corvid agenda and plenty of Buzzards were up and soaring. Later, the Rooks were in fine voice in the trees opposite The Morris Dancers at Scarisbrick. 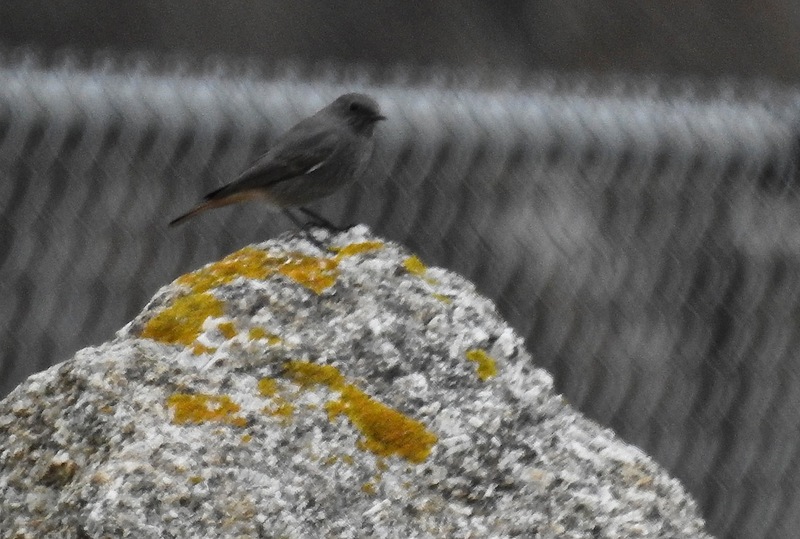 Haskayne Cutting was quiet apart from Tree Sparrows, titmice, and Red-Tailed and Buff-Tailed Bumblebees. 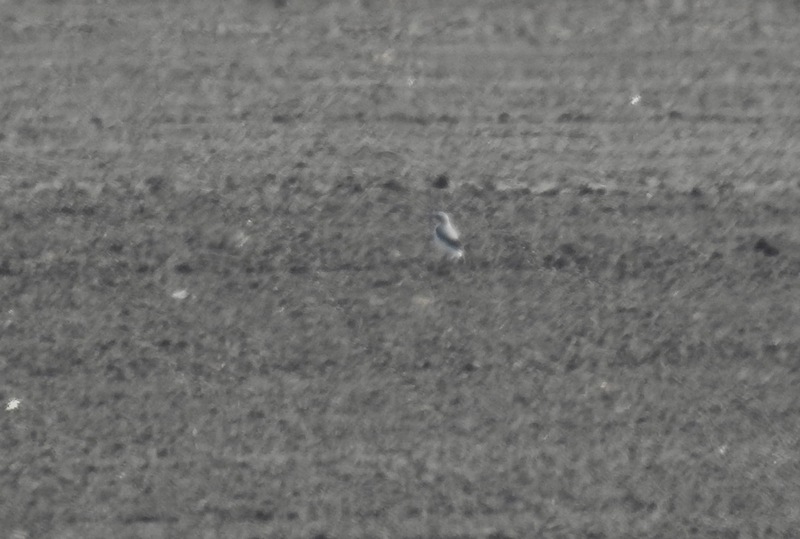 Way out on the soil from Station Road I picked up my first Wheatear of the year – fine though he undeniably was, he was a long, long way away (ya first ain’t necessarily the best). There will be others a wee bit closer I trust. 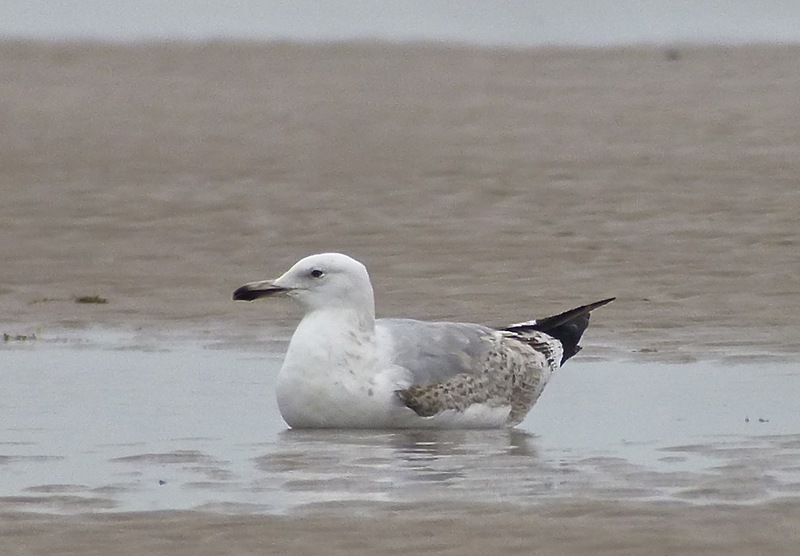 When you’re half a leg short of a full pair, a nice sit down is probably just the thing – so I was pleased to find Stumpy the Caspian Gull taking it easy on Ainsdale beach at lunchtime. The bird always looks so awkward when it tries to keep its balance standing up too. Stumpy looked a bit wary today, which wasn’t altogether surprising as I nearly hit him in the wheels as I hurtled into work a few days back. Stumpy had just launched himself off his favourite lamp-post on Shore Road and swooped down in front of my windscreen, shearing away unharmed just in the nick of time – now that would have been really embarrassing. 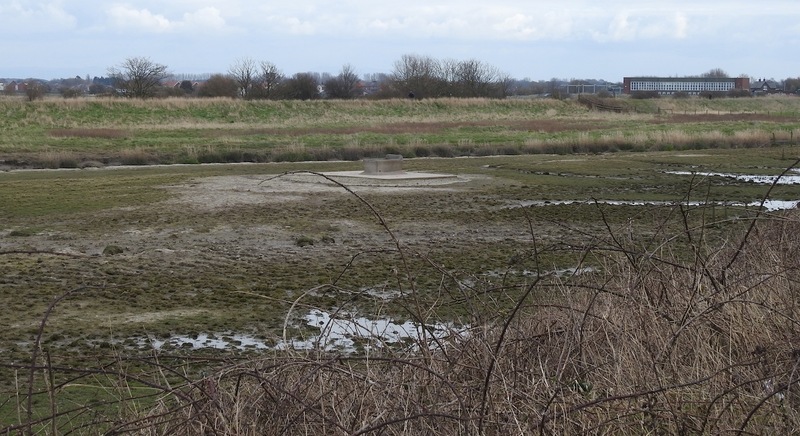 The sands were pretty quiet in the continuing cold, grey today, although the “New New Green Beach” is looking perfect for Natterjacks (if the water doesn’t evaporate and dogwalkers can keep their pets out of it – I know, a forlorn hope), and hosted about 30 Mipits, 3 Pied Wagtails and 3 Skylarks. 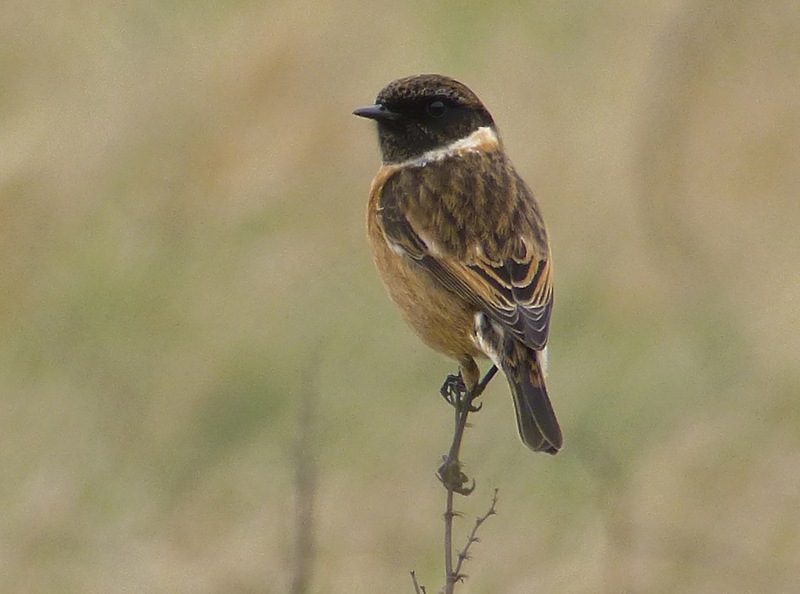 Stonechat singing in the frontal dunes, but nowhere near as accommodating as the birds down at Hall Road that I had the pleasure of showing to a guided walk on Monday. At least two singing males there at the moment. 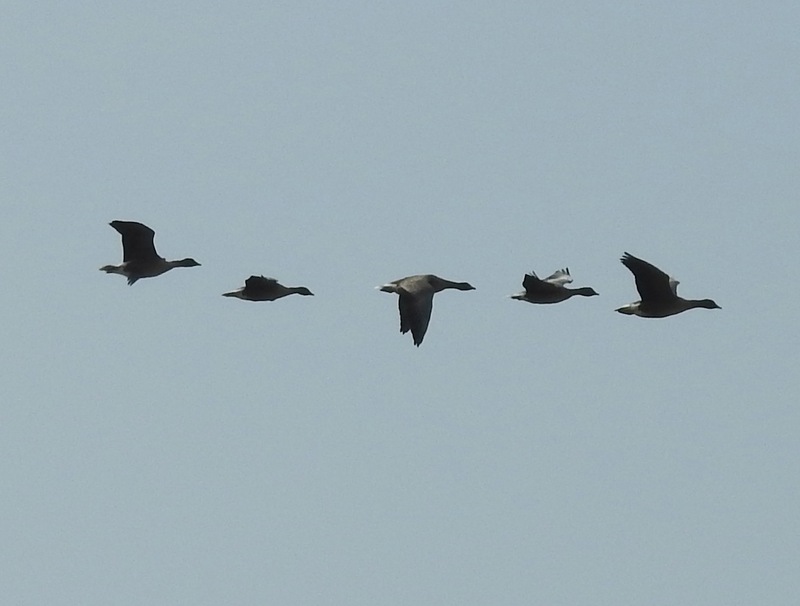 Earlier this morning a quick sweep of the flat calm rising tide at Ainsdale gave me approximately 500 Common Scoters still (distant), 8 Great Crested Grebes, 6 Red Breasted Mergs and 2 Red Throated Divers. Sometimes you can forgive the marsh for another cold, Wheatear-free March morning, and today was one of those times. 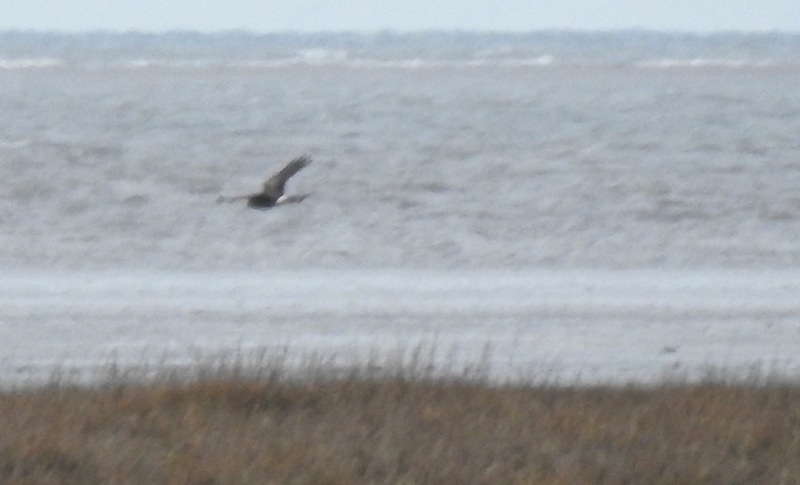 Things started off well enough with the ringtail Hen Harrier patrolling the edge of the marsh from the Sandplant – long range record shots, but I think it is a young male, what does anyone else think? 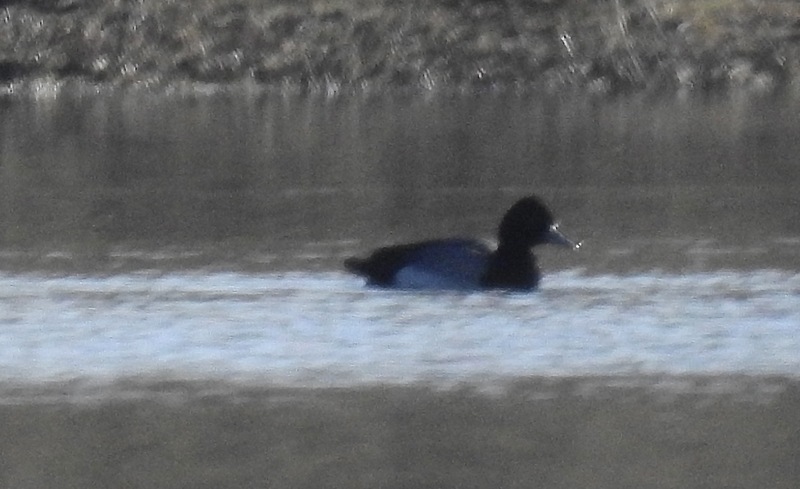 It certainly seems to have had a fairly set schedule over the winter, usually winging past here mid-late morning most days, although this is the first time I’ve caught up with it. 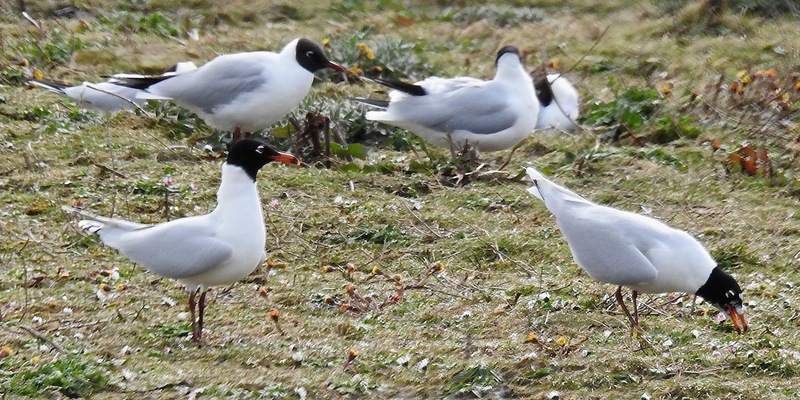 Sandgrounders was infested with staff from Natural England as Tony Baker was showing them around on a marine-type training day, and they’d picked up a Med Gull amongst the BHGs. 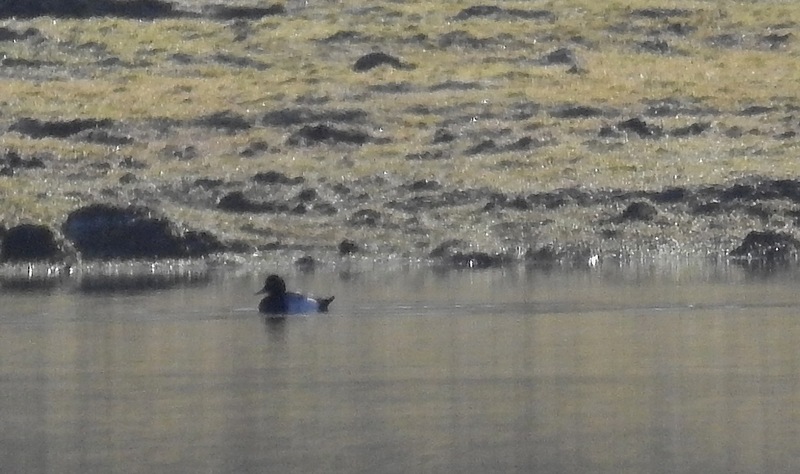 I slipped out to have a quieter look at it on the sandplant lagoon, where there were still two Pochard drakes. 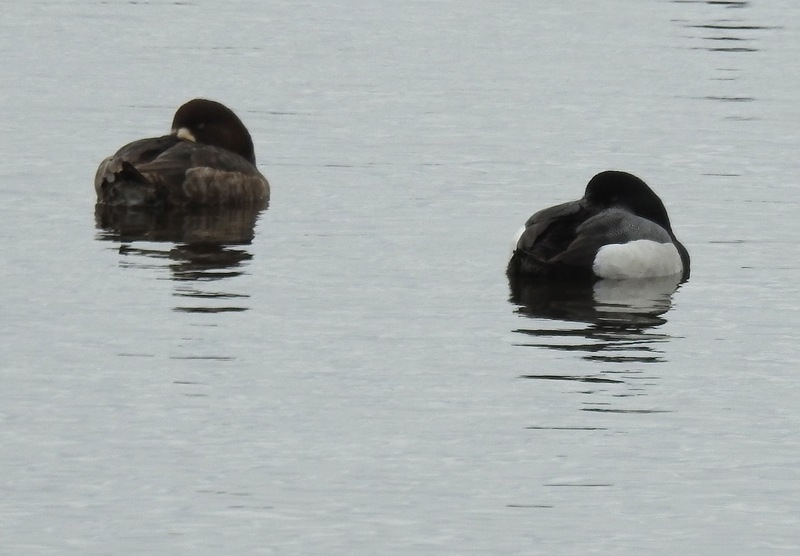 The floating shapes of all three comatose Scaup (two males, one female) were on the Junction Pool amongst the Tufties, and while wildfowl numbers have obviously fallen away, the regular waders were about in force. More parties of Mipits about today, but no other obvious signs of movement. 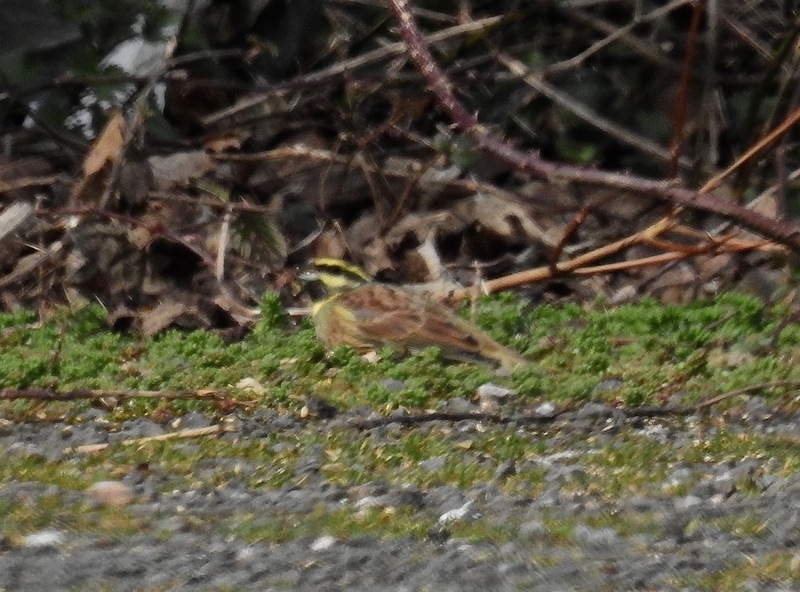 Mad Dog Bannon and Ron Jackson turned up, and we headed up to Crossens Outer for pipit pain. Two Ravens were out on the cow carcass before the pipitry began. 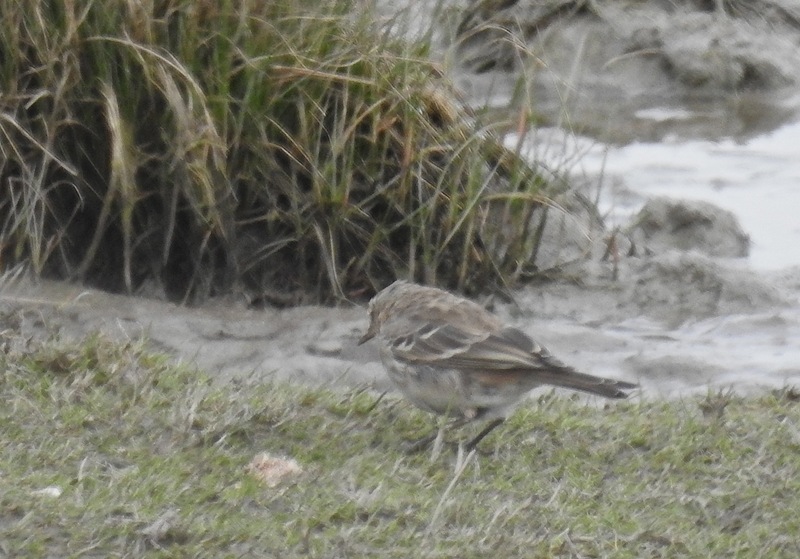 Actually things went swimmingly – I picked up the full adult Water Pipit found by Pete Kinsella and Mark Nightingale yesterday, just east of the concrete water trough, and had great, if brief views, before it sped back out of sight down the banks of the Crossens Channel. Lovely blue grey wash to the nape and unstreaked mantle, with pale flushed chest and underpants – superb. 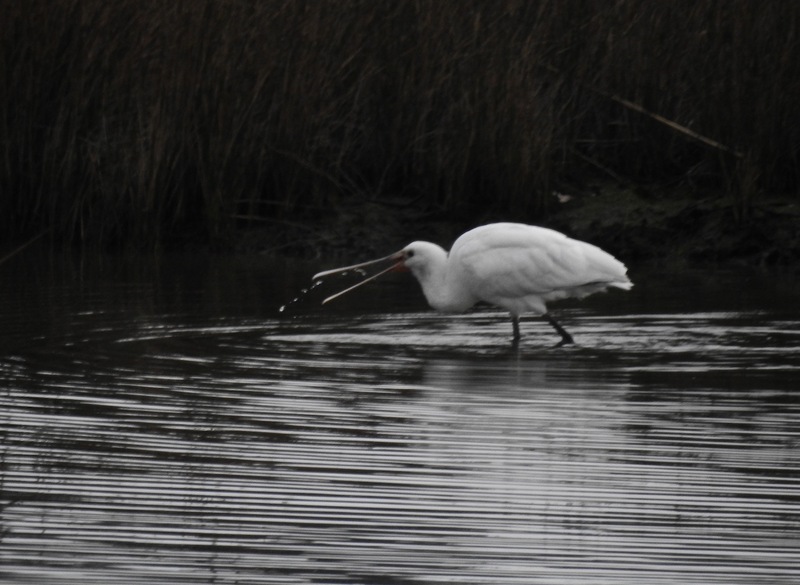 This one pumped its long tail (like a wagtail) frequently and moved with a strange almost Jack Snipe like bobbing motion as it fed. 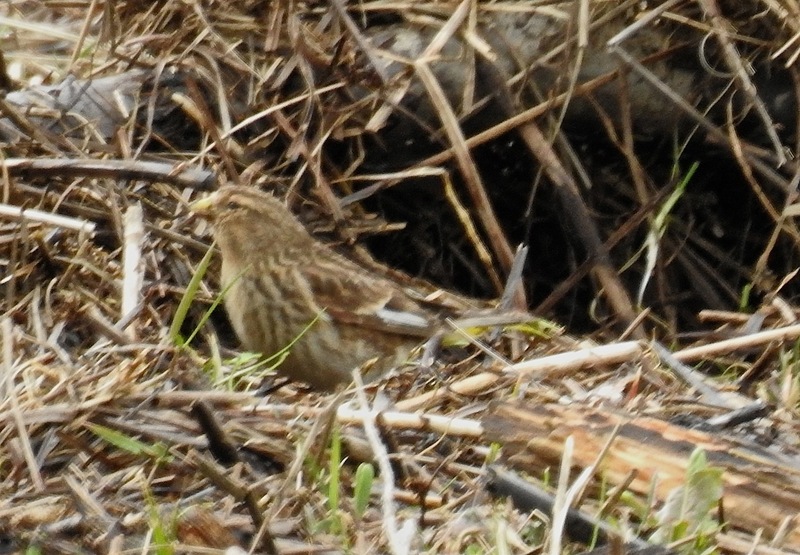 The Water Pipits called once or twice, but this was really hard to pick up against the roar of the traffic. 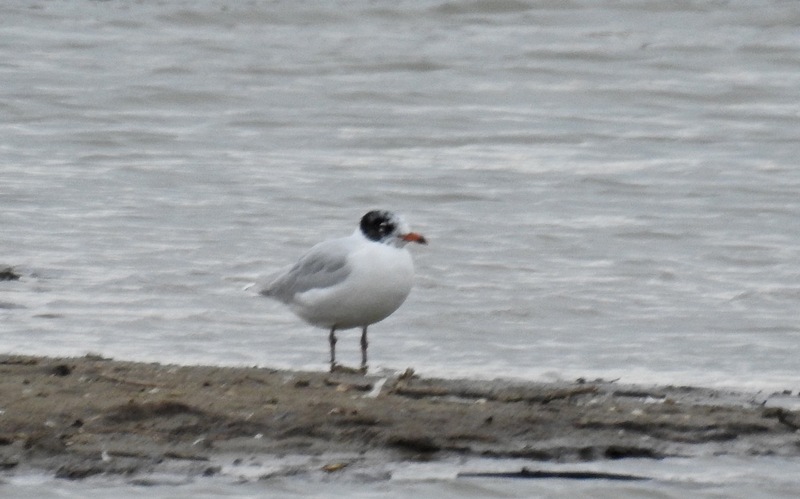 If you’re trying for these birds (and they are difficult), they are extremely flighty – best bet is to use the cover of the taller trees along the bank and look ahead of you as they seem to like feeding close to the bank – although the summer bird was out in the open today, albeit briefly. 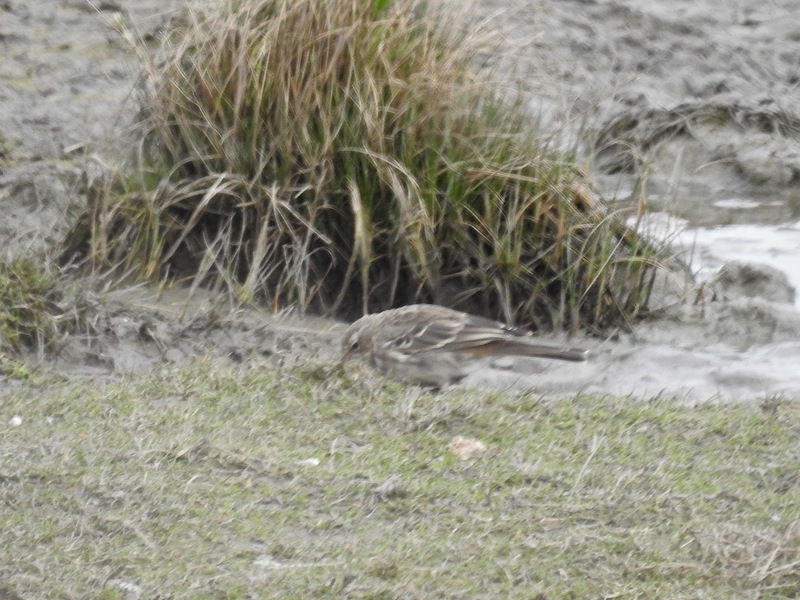 Water Pipits are always worth the effort. There were about 30-40 Mipits here today too, but if you walk up and down along the pavement you’ll just flush the lot. 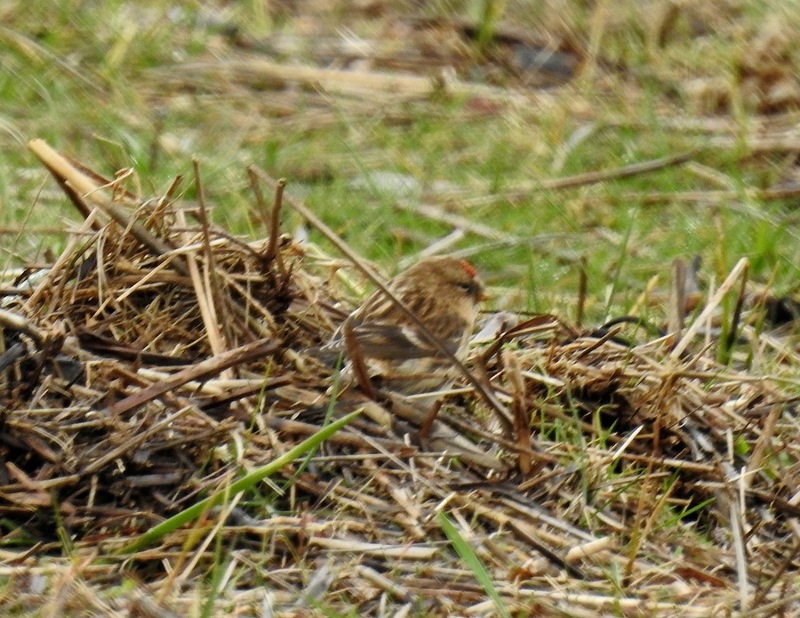 Best to find a spot on the bank, hunker down and hope the pipits drop in in front of you. Gorgeous blue skies belied freezing cold air today at Marshside – it looked great, but the temperature told a different story. 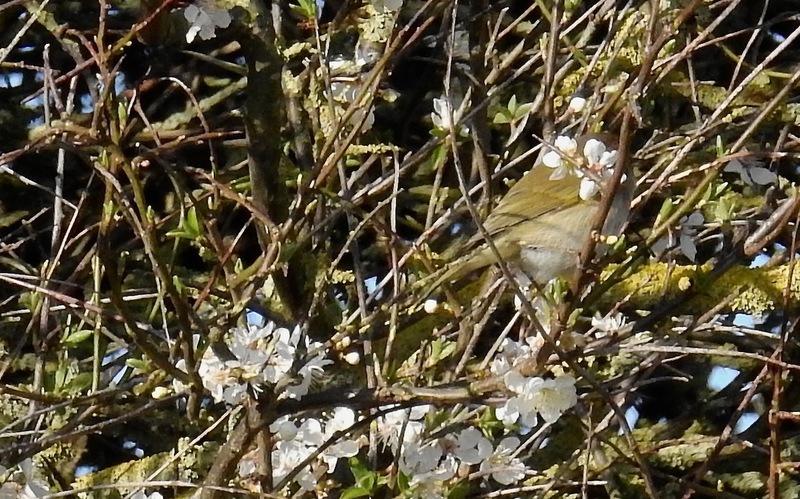 A bit of a blocker on much migration, although two Goldcrests and a Chiffchaff were in the bushes on the south side of the Sandplant, and frequent Red Tailed Bumblebees, Lesser Celandine and Coltsfoot teased that spring was around somewhere. A pair of Avocets were cosying up on the island in front of Sandgrounders Hide – I can hear the clatter of a bazillion unnecessarily unsilenced shutters already. Small parties of Mipits were moving north, but most were birds already displaying on territory, and the few alba wags about were all Pieds. Nicest of all were the two Ravens circling and croaking above the sandplant before they slid off inland as if in the direction of the ghost of the gasometer. 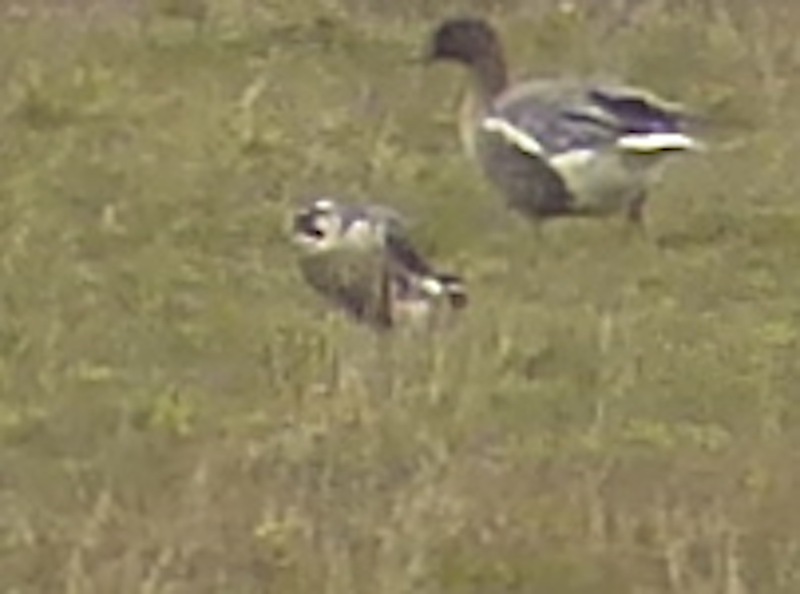 Quite a lot of Pink Feet still on the outer marsh, moving about restlessly in small groups, but the wibbly wobbly (fake) heat haze made it hard to get good views of them. Perhaps 1,000 birds still, maybe more. 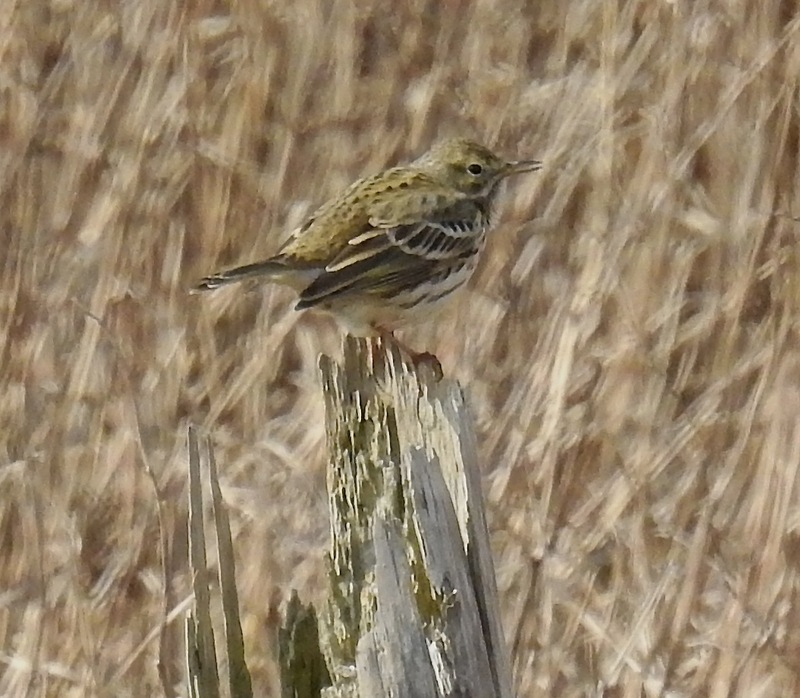 Met Pete Kinsella and Mark Nightingale who were enduring Water Pipit pain up at Crossens Outer, the pipits up there being as unobliging as ever. Very early start at work this morning as dozens of splendid old cars rolled up at Ainsdale to celebrate the 90th anniversary of Henry Segrave’s land speed record in his Sunbeam Tiger on the sands in 1926 when he hit 152mph plus (hell, I went faster than that when the Blackpoll turned up at Seaforth). After all the motorheading it was far too nice an afternoon to just head home, so I drove up the coast, only realising I’d left my binolikars at home just as I pulled into Weld Road car park. This is a classic sign of advancing years in birders of course, but the first time it has happened to me. I decided the best way to remedy this situation was a prolonged, colourful and loud cursing session (hence my potential exclusion from Baby J’s very own Sunbeam Club) before schlepping back to Dempsey Towers to pick up my optics. 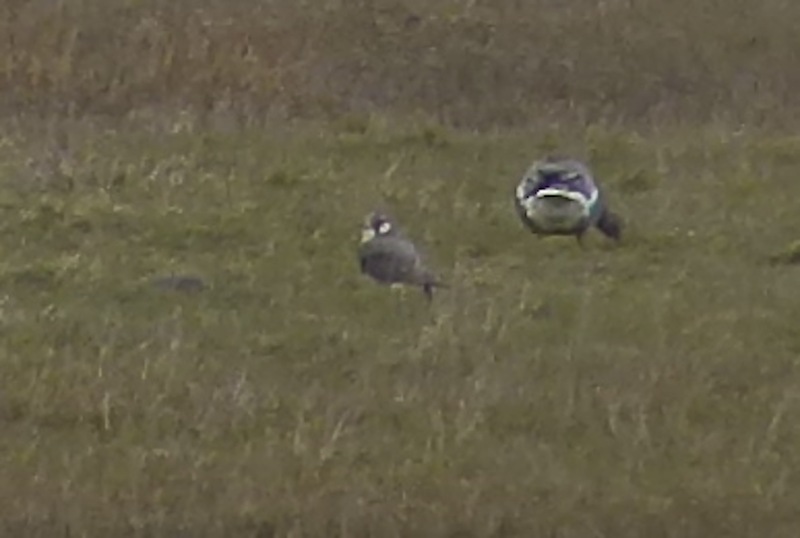 I finally got up to Marshside mid-afternoon, first calling into Hesketh Road, where Pinkies were dropping onto the water for a wash and brush up after feeding with the 2,000 strung-out flock still on the outer marsh, and a herd of about 200 Wigeon were grazing in Wheatear Corner. Otherwise it was as quiet as you’d expect in a chilly north easterly wind. 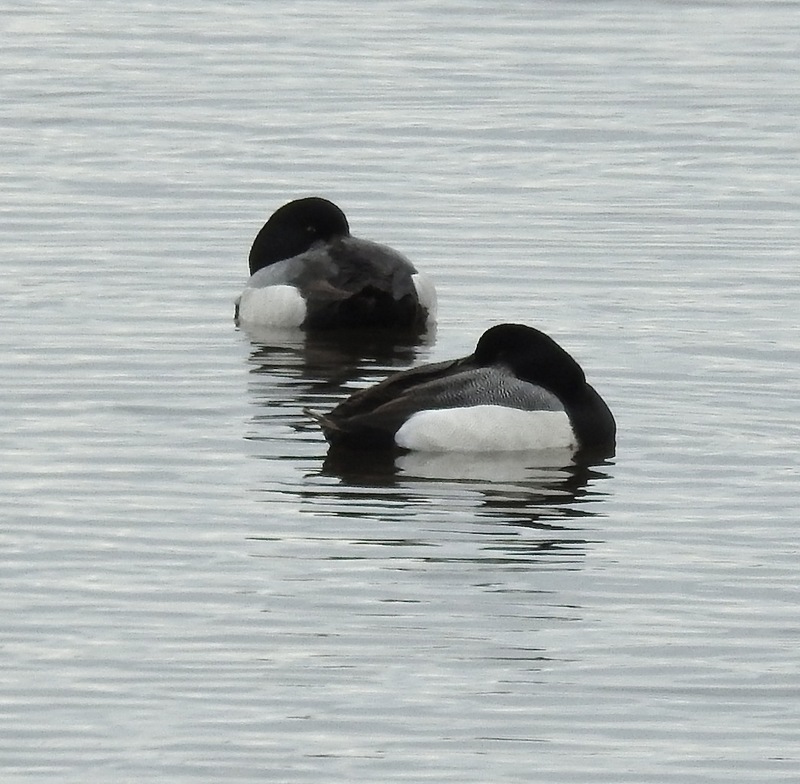 The two drake Scaup were snoozing at Junction Pool amongst the Tufties and the drake Pochards were still on the Sandplant lagoon. The BHG colony is getting noisier by the day. Warmer in the sun on the southern side of the Sandplant, and a Chiffchaff was zipping about the willows and blackthorn in between bouts of tail-pumping, while a Small Tortoiseshell tottered past. Seems a long time ago (and a lot of road miles), when Neill Hunt picked me up on Thursday evening and we drove through the night to Cornwall, pitching up at Sticklebrick Lake before dawn. 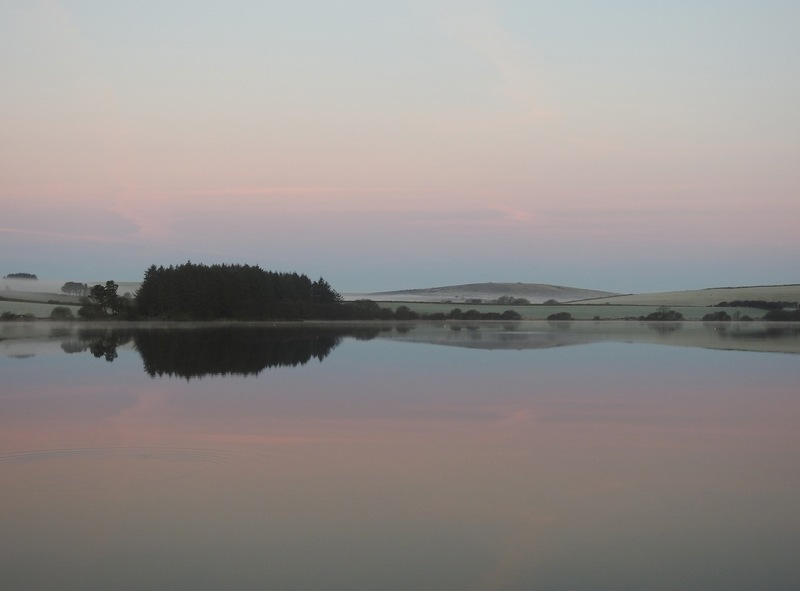 I think that’s what it was called, it may have been Siblyback Reservoir – either way, we were both knackered and it looked mighty fine at first light, with the surrounding moors covered in a heavy frost. Pretty as the lake was, the long-staying drake Lesser Scaup was nowhere to be seen, so with mild frostbite, we headed out as the sun began to warm the landscape to Dozmary Pool – no sign of the Smew that has been hanging around there, but luckily the Lesser Scaup had relocated and we had good, if distant, ‘scope views of the little beauty. 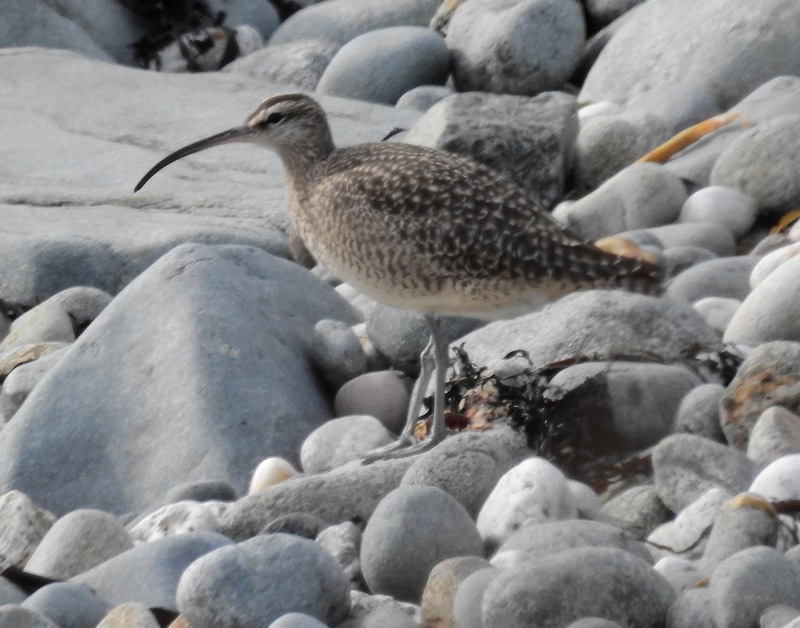 With the temperature rising (we’re a good week or two behind spring-wise up here), we drove onto Perranuthnoe and went scrambling over the scree, boulders and rocks to the east of the village in search of the Hudsonian Whimbrel. 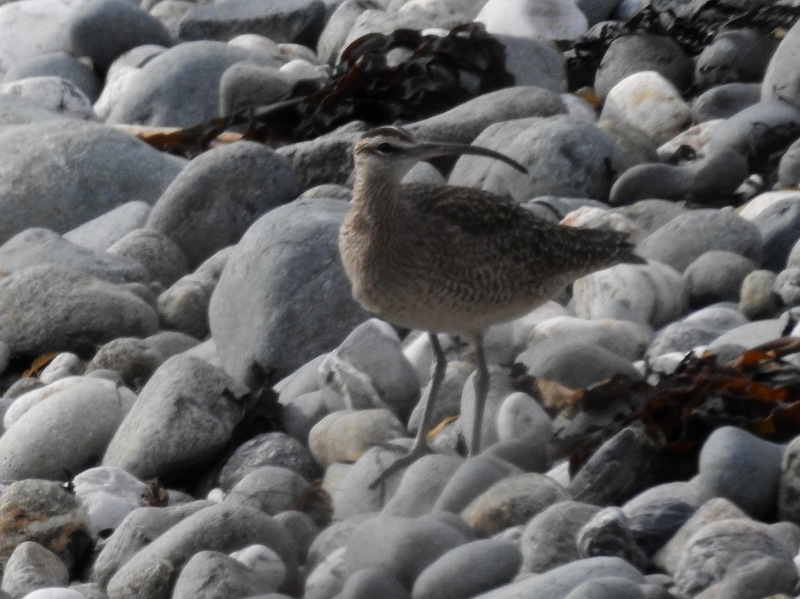 Great Northern and Red Throated Divers offshore, Fulmars overhead, but the Whimbrel was AWOL. St Mounts Bay looked good, but it would have looked better with the Hudsonian Whimbrel in it, and after checking the waterfront around Marazion for the Yankee wader without result, we moved on west of Penzance for pleasant, if uneventful birding in the sun. 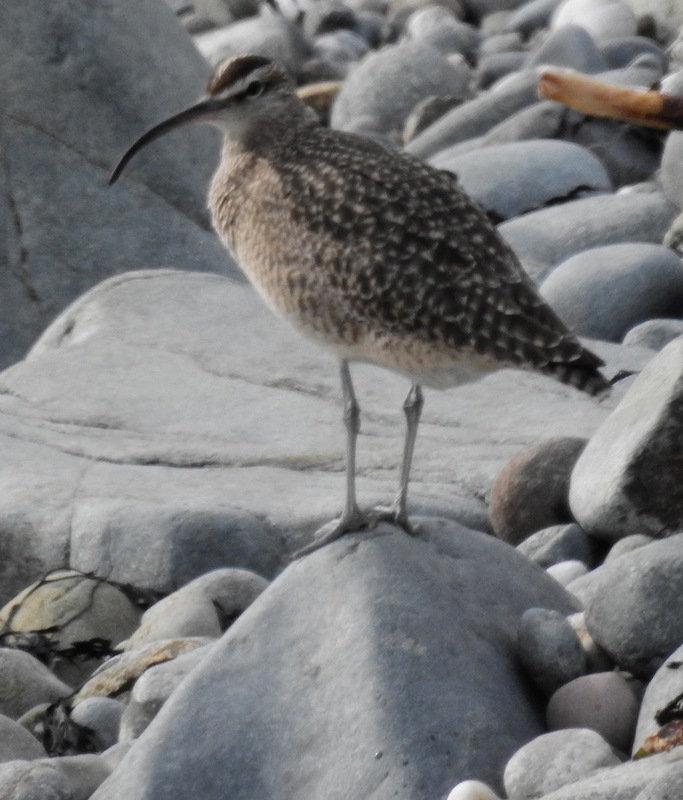 We got back to Perranuthnoe in the early afternoon, and this time walked west to Boat Cove, where after a bit of a wait, the Hudsonian Whimbrel suddenly emerged from its hiding place in the rocks, pushed out by the rising tide. It treated us to a buff-rumped five star fly-past. It looked small and uniform-coloured in flight, and in a bizarre way it reminded me in flight of an Upland Sand (apart from the bendy beak of course). 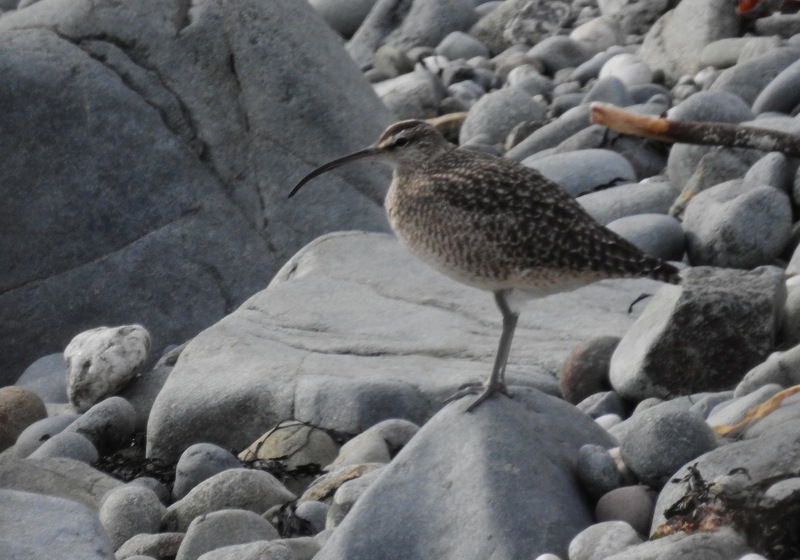 Was the trademark Whimbrel trill a bit different too? 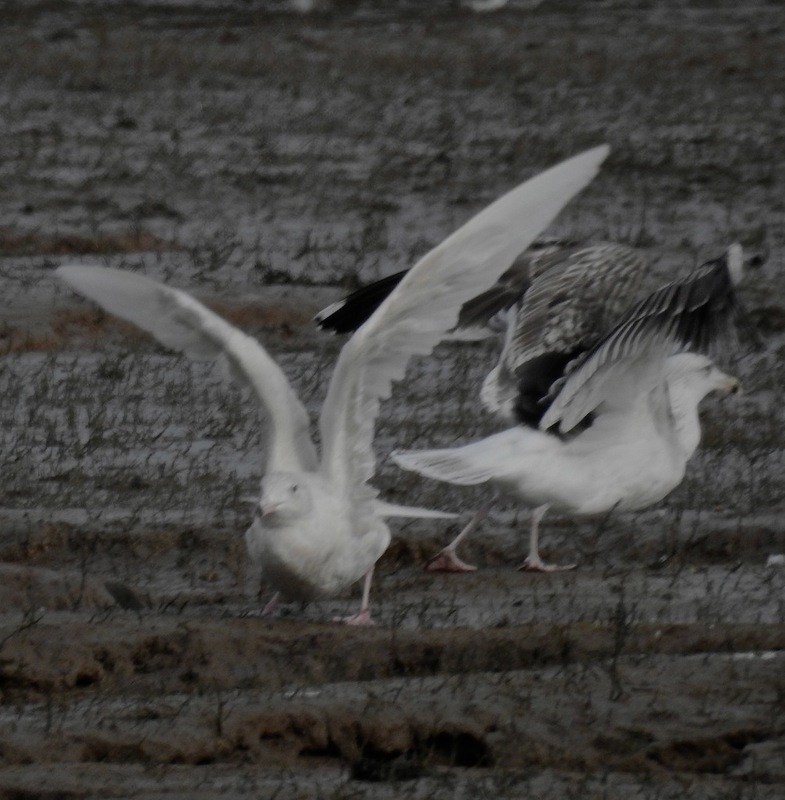 Perhaps softer toned, or quieter than our birds….not sure? 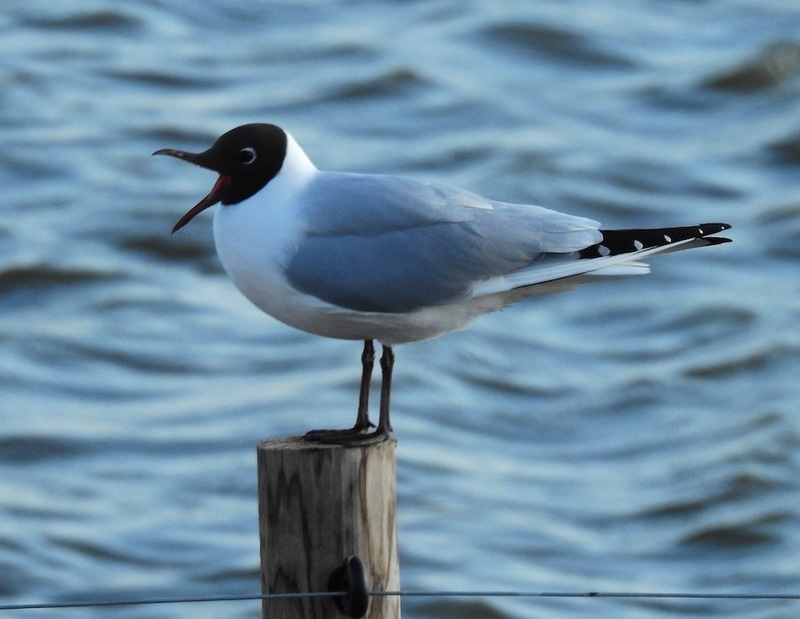 Superb – my first British tick of 2016. 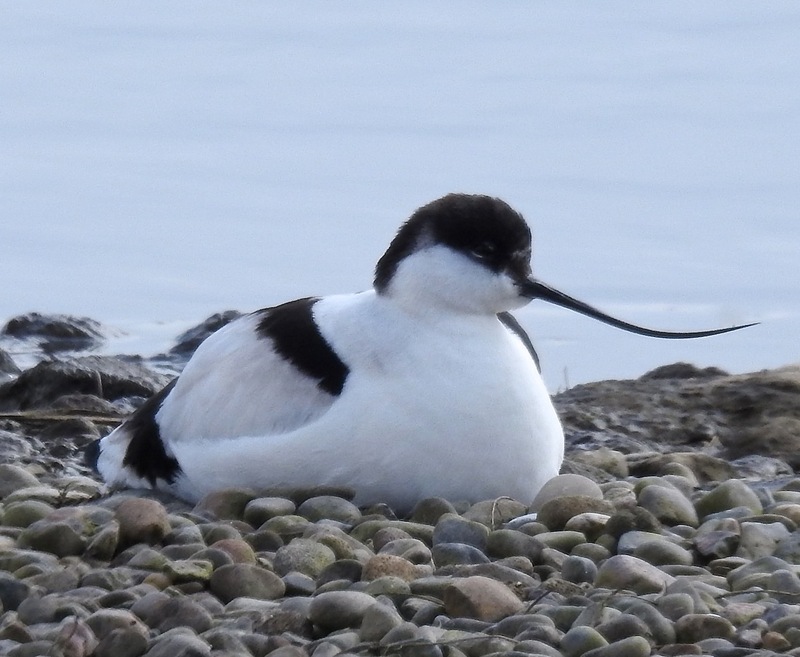 The bird circled out over the sea, before dropping back onto the shore to feed amongst the rocks around an old high tide strand just beneath the coastal path. Small Tortoiseshell and numerous bees out as we walked back to the car, mojo reinstated, all smiles and ready for more Cornish birding. 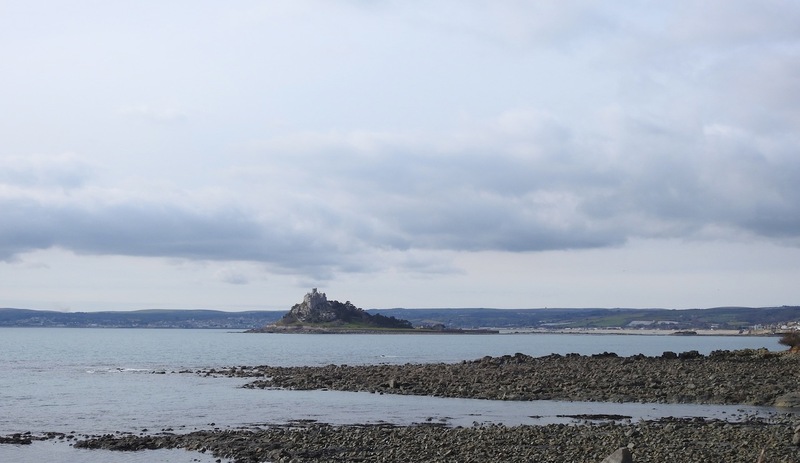 We called into the rocks behind Penzance railway station, a particularly salubrious neck of the woods, hidden to the world by a high wall, and consquently the haunt of loons (no, not the diver kind), teenagers and all manner of local “character”. 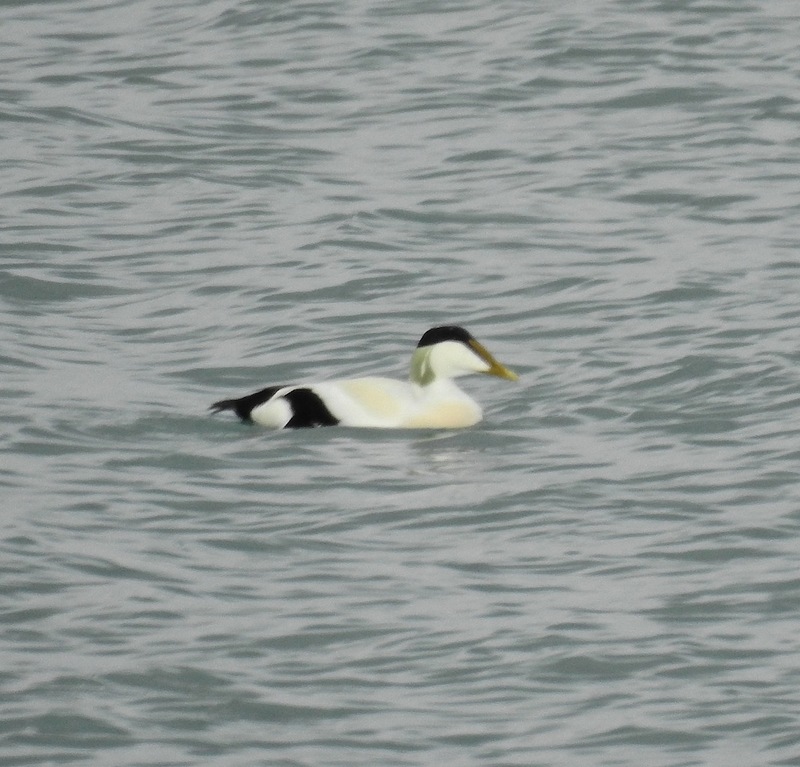 At least two of the six Black Redstarts wintering here were showing and a fine drake Eider was offshore. Goldcrests were singing as we pulled away from the Penzance harbourside and went round to Mousehole to settle in outside the Rockpool cafe with a strong coffee to check the gull roost that builds every evening on St Clement’s Isle just offshore. Remarkable how quickly spring disappeared as the sun sank and the mercury plummetted. 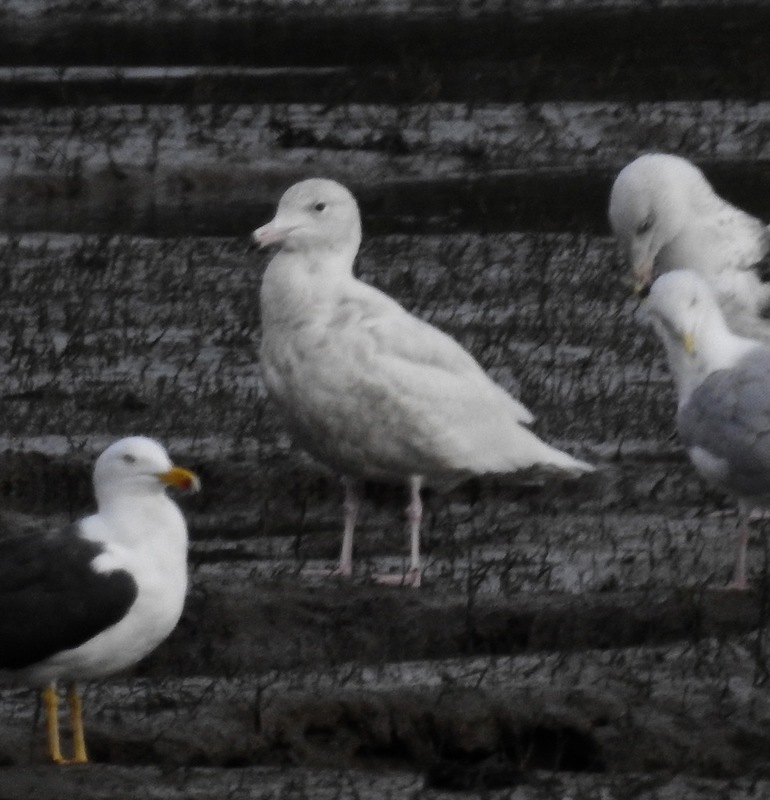 We couldn’t pick out the American Herring Gull or Glauc that have been coming to roost here and called it quits at 1730 to whizz back to Penzance, book into a splendiferous bnb, shower, then speed walk down to The Dolphin for a Friday night away game. This marvellous pub is apparently the site where Walter Raleigh smoked his first potato, the humourless ghost of Oliver Cromwell scowls at the clientele and most importantly it has long been the watering hole of choice for the unit whenever we find ourselves in Penzance. 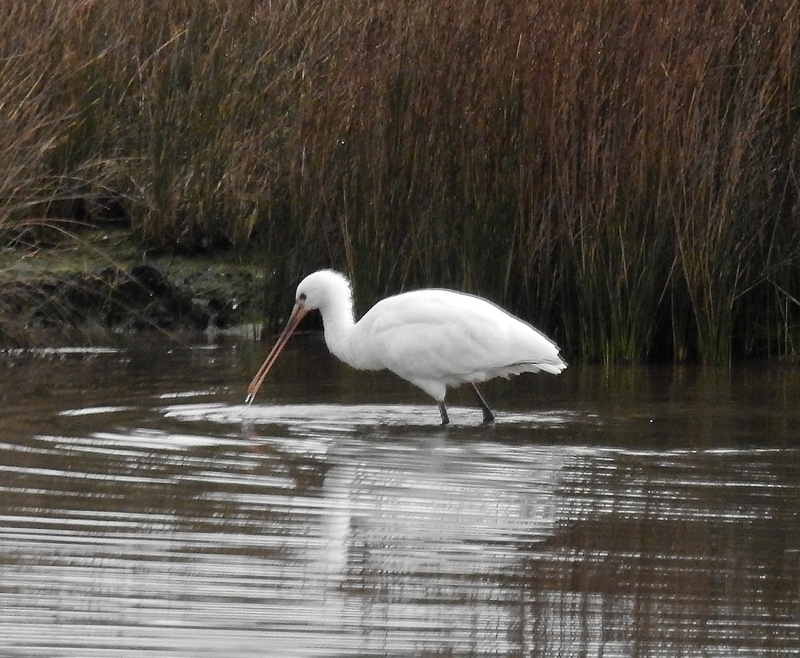 A good kippage later and stuffed with a full English brekkie we hit the Hayle Estuary first thing this morning for Kingfishers fishing from pylon wires, hordes of Med Gulls and a young Spoonbill sweeping the still shallows at Ryan’s Field. 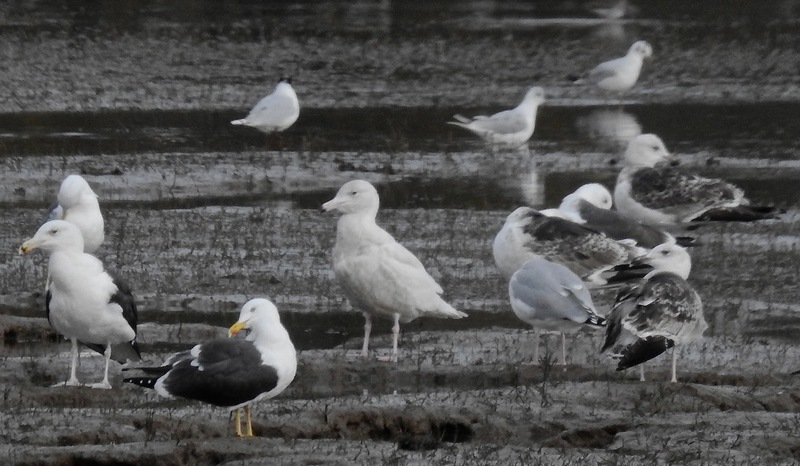 A reasonable gull roost on the mud at the end of Lelant Water had a corking young Glaucous Gull, 30+ Med Gulls, and at least four Greenshanks, while two Chiffchaffs were singing in the trees behind us. 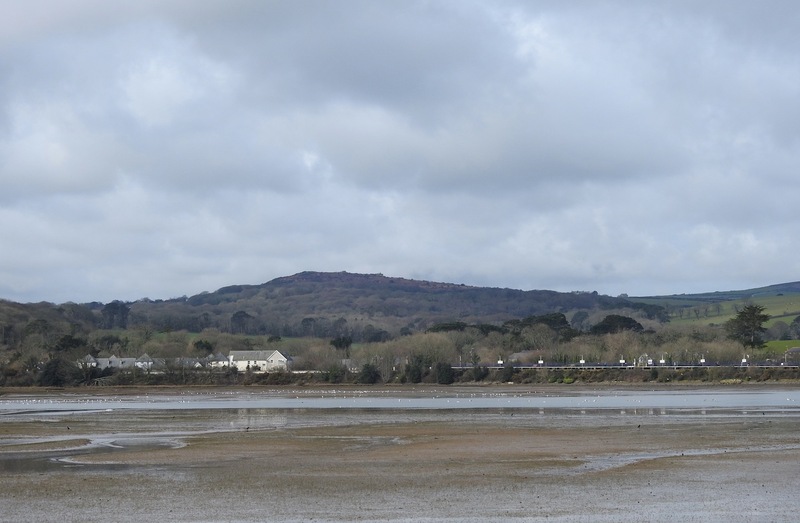 With Neill at the wheel, we left the Hayle at about 10am and began the long journey back uphill to the north. 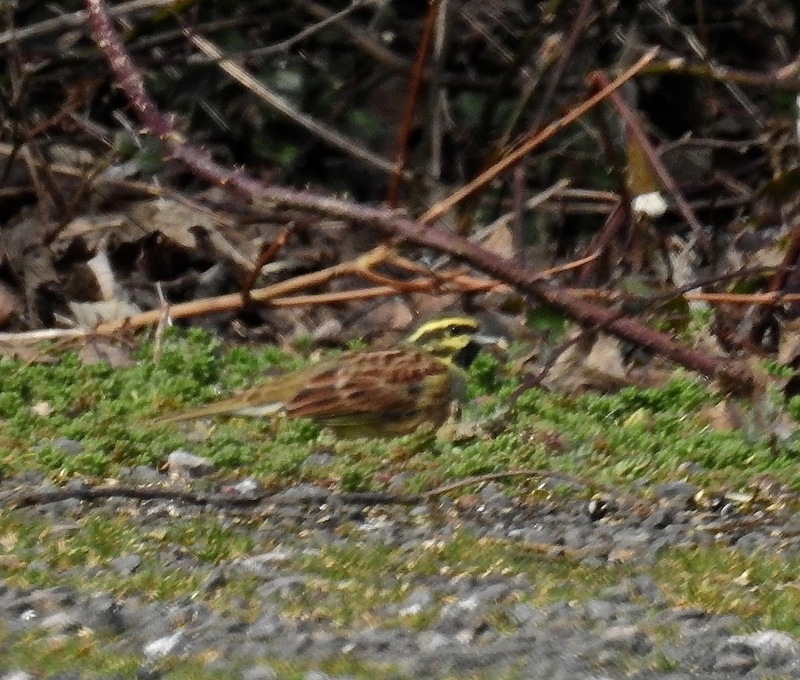 A minor detour later and we were able to check out Broadsands on the English Riviera for Cirl Buntings by lunchtime. Two males and one or two females came down to the feeding station in the warm sun and a Raven croaked overhead, like they always do. My attempts at photography were as risible as ever, although the chance to watch the wary Cirls for the first time in Blighty for many years was mighty fine. Offshore a Black Throated Diver was roll-preening before we returned to the tarmac. 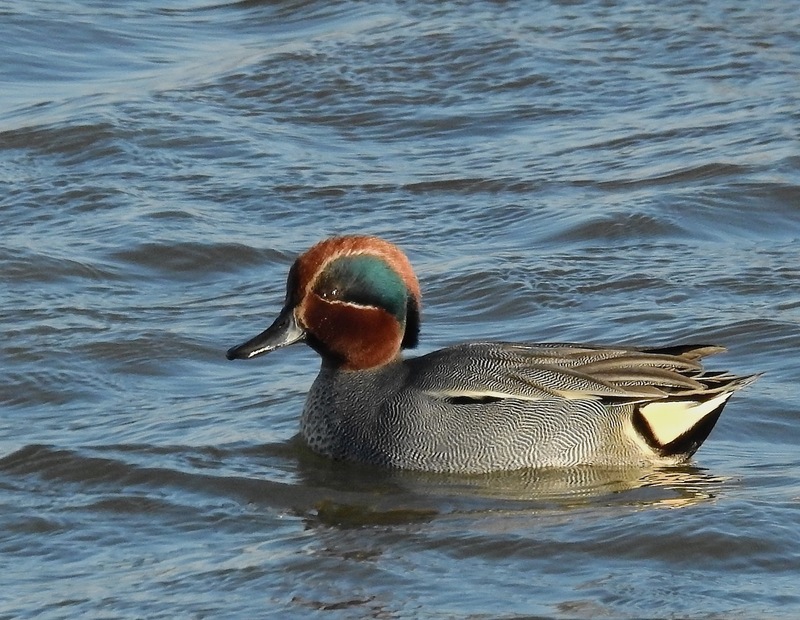 Thanks as ever Neill – a great two days, plenty of miles, plenty of laughs, plenty of birds. Quiet, like the lull before the storm of spring passage out on the mosses today, but good and bright, with 45 Curlew feeding alongside approximately 200 Common Gulls on Plex, Common Buzzards circling and just a handful of Pink Feet in the distance out on Carr Moss. 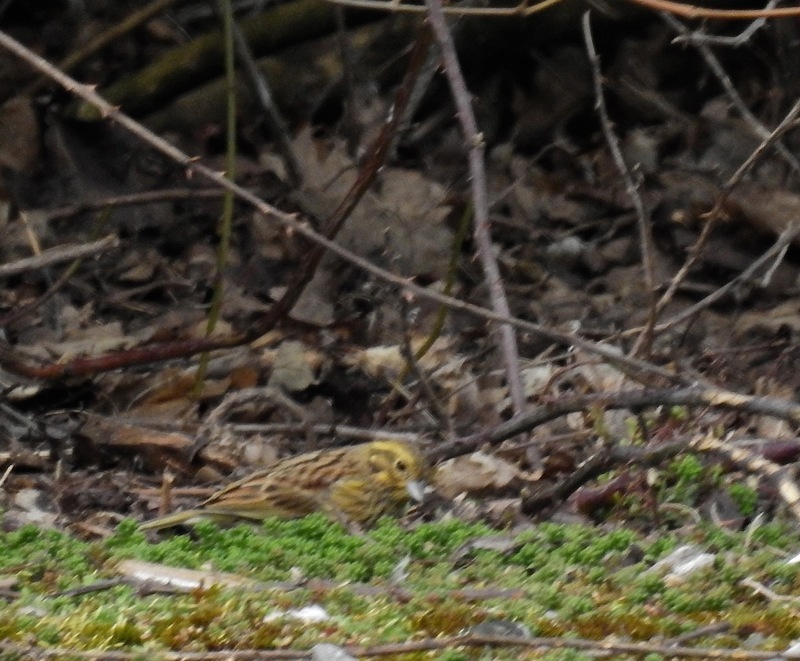 Corn Bunting and Skylark on Plex, but neither were singing, yet the latter was chuntering away over the Withins. 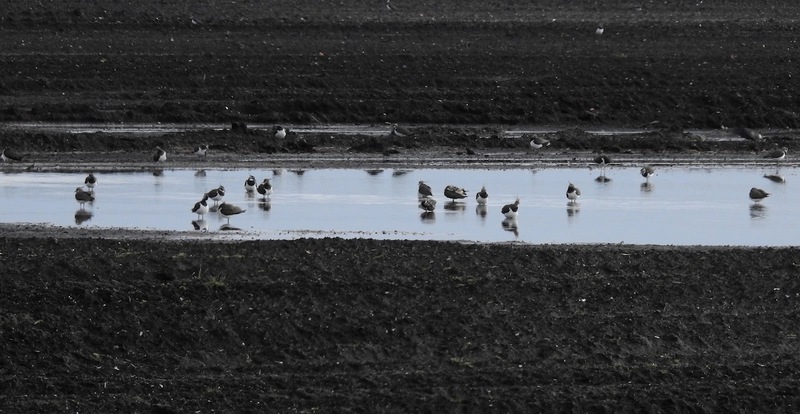 Lapwings chilling at a few of the shallow floods in the ploughed fields – these could be great wader traps if they don’t drain in the next week or two. Eight Rooks feeding off Plex Moss Lane with Carrion Crows and Jackdaws – presumably these are birds from the rookery(s) at Scarisbrick. 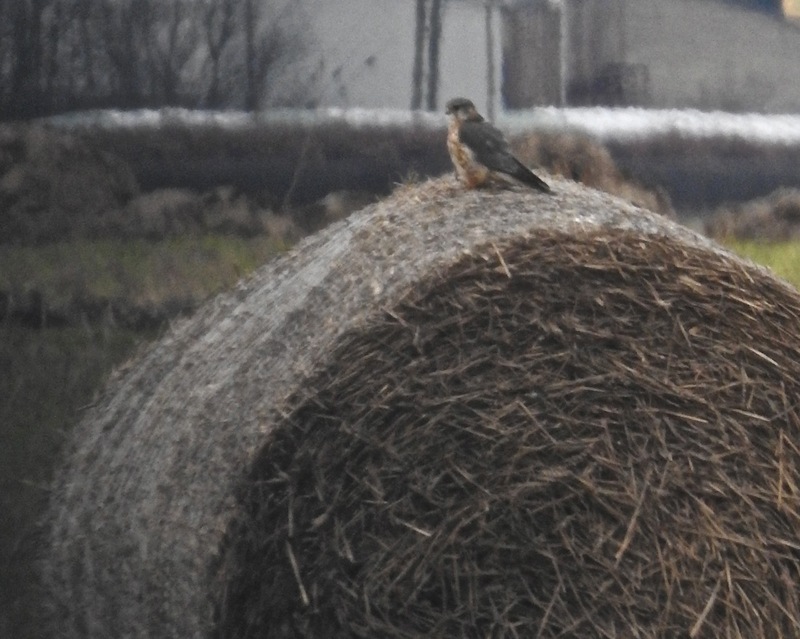 More Curlews, Shelduck, Common Buzzards and Pied Wags out on the Withins, where a nice young male Merlin kept an eye on things from an old hay bale, waiting to pounce on any Mipit dumb enough to come too close. 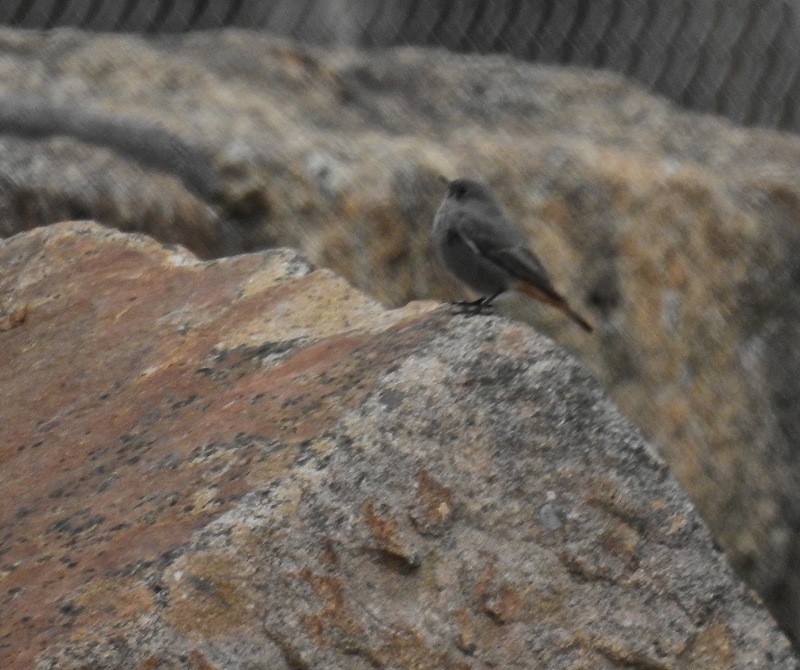 First Wheatear can’t be far off now, but the wait is always a killer. Many thanks for Dave Craven for waking me up this afternoon (see comments on previous blog entry) – no doubt about it, by the time I got up to Crossens Outer I was way too complacent in my treatment of this “funny” falcon out amongst the Pinks. Yes it was a very, very long way away, but as Dave rightly suggests, “calidus” Peregrine might have rang bells in my head, rather than me dismissing this bird as yet another weirdy hybrid. 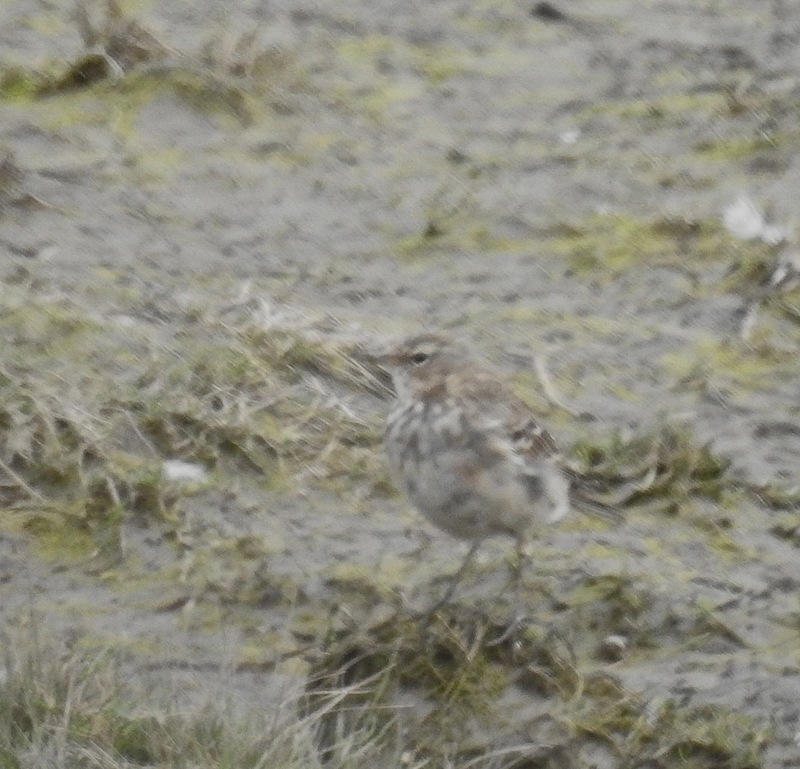 Anyway, here’s the very bad blow-ups of the bird I managed to digiscope this afternoon. 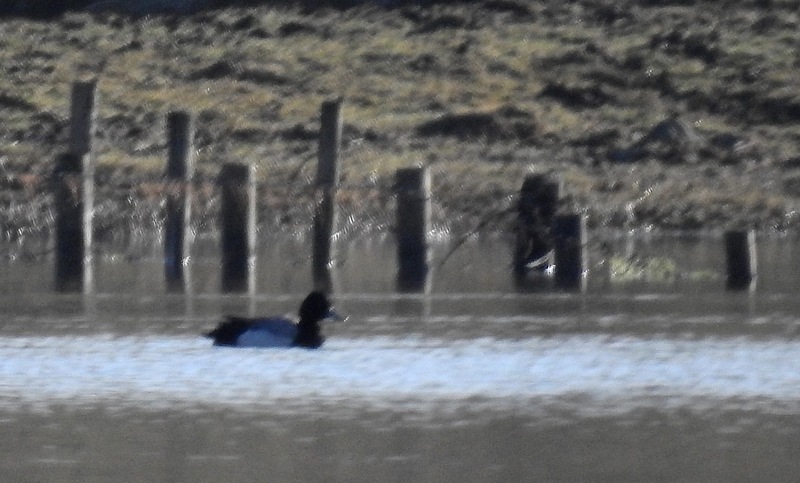 Apologies for the poor quality, these are the only images I managed, via a hand-held Lumix against my battered old Nikon ‘scope. The head pattern isn’t that far off that of Arctic Peregrine or “calidus“, but the bird didn’t seem particularly big, and it’s underpants weren’t as pale as I would have expected. However it certainly didn’t strike me as long-winged or long-tailed compared to normal Peregrines, but then it wasn’t more rakish or browner like a Lanner is in flight either. Structure/size was like a male Peregrine. Not far off, but not bang on either, although those long black moustaches are interesting. 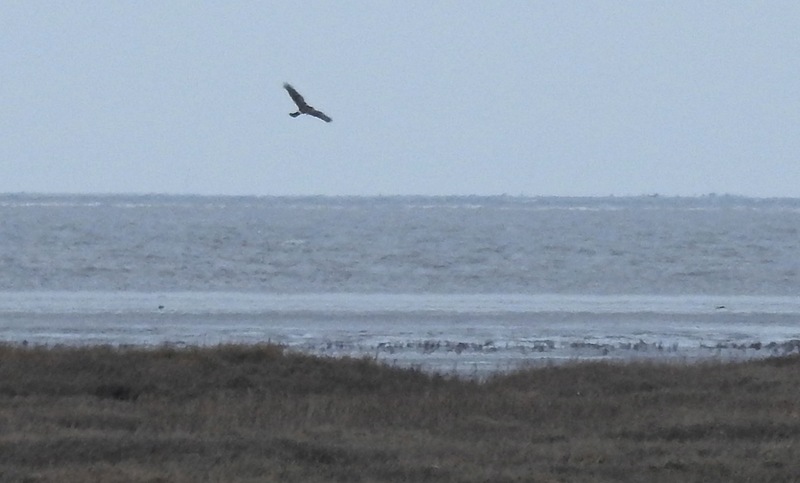 In fact, my first “blow-up” shows a rustier set of underparts, closer to “tundrius“, the Yankee arctic Peregrine race. It doesn’t seem to fit with a falconry hybrid, that’s for sure. This bird is a valuable lesson in the importance of keeping your radar switched on…I won’t be dismissing falcons as hybrids on the strength of pale heads again, that’s for sure! 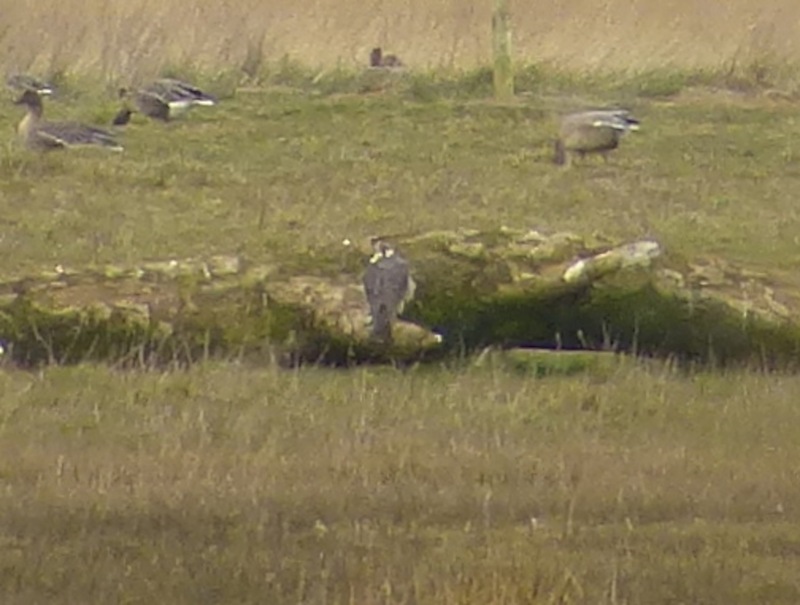 I’d love to know what other people think about this falcon (that’s what the Birdblog is for after all, if folk ain’t using the comments thingy, then I’m clearly not writing it right) and while the opportunity for me to nail it has passed, perhaps someone else may catch up with this bird at the marsh tomorrow and get a better view? Good luck if you do…please let me know if you see it. Many thanks to Dave Craven for getting me thinking, and of course to the source material of Martin Garner‘s “Challenge” series, and the great man’s amazing ability to never stop querying or questioning in the field. I couldn’t say I had the privilege to know Martin well, but I did meet him a few times, and he was always encouraging whenever I had a daft query about races/sub-species – he’d be giggling now.